If you’re at home, it’s home base. You know the tactical situation, all available exits and the location of all useful materials for accomplishing your mission. But when you’re at work, at a restaurant, at a neighbor’s house... you’re at the mercy of whatever you might find. As the person extends a hand to shake, you’re partially mumbling some excuse about just coming from the bathroom and then you realize that story doesn’t sound good. Are your hands damp because you just washed them? – or because you just didn’t? You can try to quickly give your hands a few more passes up and down the sides of your pants – but you know they’re still going to be sufficiently damp. That moment of squishy hand contact is inevitable. You can only stall for so long. 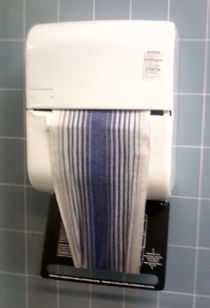 So my newest recommendation is this: Don’t even try to dry your hands anymore. Come out of the bathroom/restroom with water dripping off your arms and hands like you're in the middle of fixing the plumbing in there and you just stepped out to take a break.